In Robert Hague’s lithographic prints, individual objects are isolated for close study as the artist draws out the meaning behind their form and function. 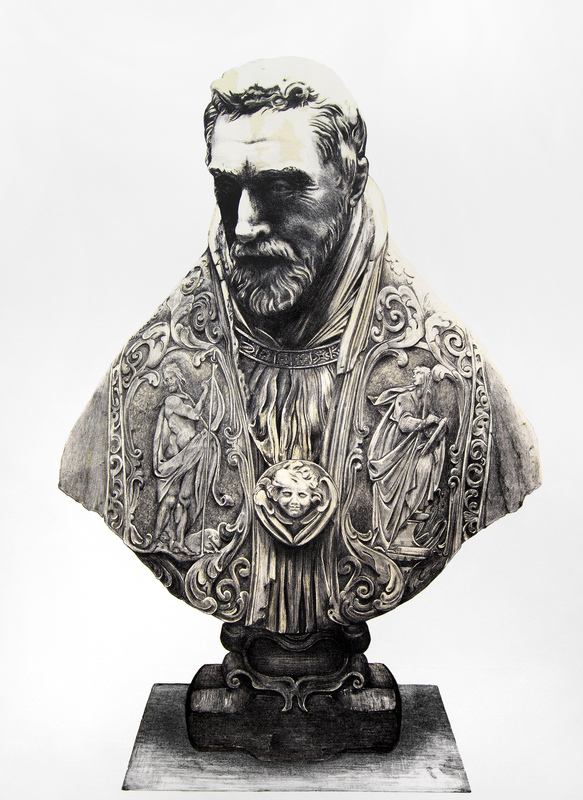 Rendering his images with crayon upon stone, elements from disparate sources are seamlessly blended for an inventive conceptual dialogue. His Trojan Hammer series sees Hague evoke a cunning deception. The blunt instrument of choice, a hammer, becomes an agent of destruction and subterfuge, as it hides within otherwise benign objects to illustrate the contradictions they hold disguised. 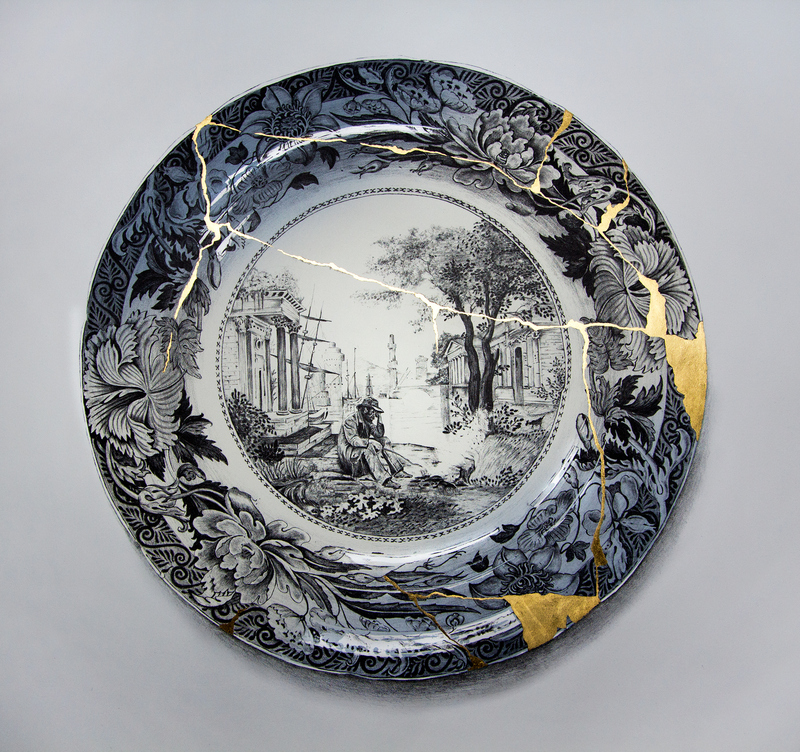 While in his more recent Plate series such illusions have been broken. Colonial dreams shift towards a dystopian reality, their instability reflected in the broken forms of the fine bone china plates he depicts. These recent lithographs mark Hague’s return to drawing, after spending 20 years creating a substantial and acclaimed corpus of sculptural work. 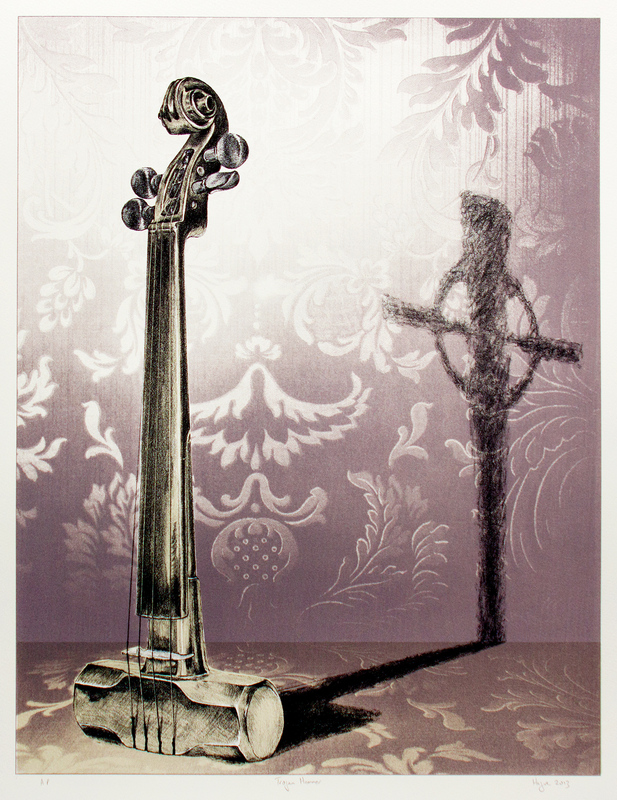 As a medium, lithography relies upon marks made with waxy crayons or tusche washes upon aluminium plates, or in the case of Hague’s lithographs, large slabs of Bavarian limestone. It captures the directness of the drawn mark and enables it to be reproduced in multiples. When expertly printed by Master Lithographers such as Peter Lancaster, who Hague has collaborated with to produce these prints, there is also great scope to achieve delicate subtleties of tone and line. As such, it is an ideal medium to make work that pushes the renewal of Hague’s drawing practice. One can marvel at the technical and formal prowess expressed in the prints, as the artist effectively conveys the volume and weight of his subjects – their exquisite detail and decorative patterning skillfully realized on paper. Yet while artists working in print media can sometimes fall victim to an exploration of technique at the expense of all else, Hague’s work contains a rich conceptual dialogue conveyed through his play of objects interwoven with art historical reference. Often the politics of power emerges as an underlying thread. In two of his major prints, Trojan Hammer – Urn, and Trojan Hammer – Bernini, Hague depicts artworks that are respectively the product of two great political and cultural forces; a Chinese Ming Dynasty Urn, and a bust of Church Cardinal Escoubleau de Sourdis, sculpted by the Baroque master Gian Lorenzo Bernini between 1620 – 22. Into the base of each Hague embeds a hammer – a tool of destruction, and also of creation when considering the sculptor’s work in marble. 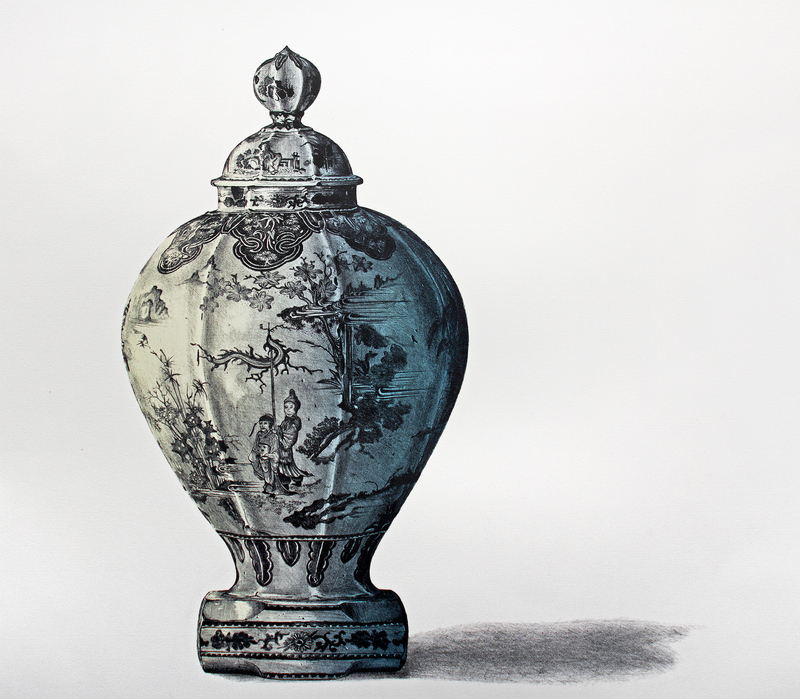 In doing so Hague recognizes the beauty and artistry inherent within these celebrated objects, while prompting the viewer to look past immediate appearances and consider their true function. As tools of glorification and an expression of political might, each artwork would not exist had a dynastic and authoritative agenda not prompted its creation. Hague quietly implies a darker duality of beauty hijacked as propaganda. 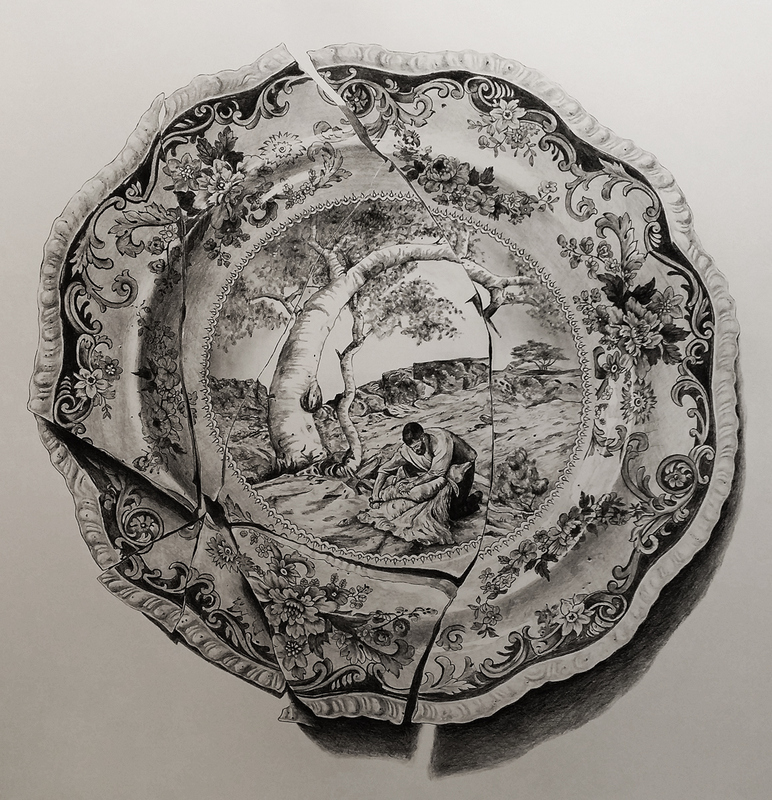 Hague’s most recent series of prints that focus on smashed porcelain plates contain an imaginative figural discourse. In Blue Claude Hague takes a broken plate and depicts in its center a classic Claude Lorrain harbour scene. Frederick McCubbin’s disheartened prospector from the 1855 painting Down on His Luck is inserted into the foreground, contemplating his ill fortune while gazing at a fire. The entire vignette is encircled by a dense floral pattern reminiscent of nineteenth century Wedgwood or Spode porcelain designs. Claude’s dreamlike classical utopia is disrupted by McCubbin’s forlorn figure from Australia’s colonial past. His search for fortune, and the brutal reality found in its place is conveyed by the violence that has been enacted upon the smashed object. The porcelain plate becomes a symbol of British imperialism, the force that led McCubbin’s pioneering protagonist to his current struggle, as he dreams of the unattainable paradise behind him. References to other British nineteenth century creative forms also appear in certain prints from his Trojan Hammer series, where the background is dominated by densely patterned wallpaper designs. These wallpapers, with their organic floral quality call to mind those of William Morris – a leading exponent of the Arts and Crafts movement that flourished in Britain from about 1880. Allusions to this craft based revival, and the historic uses of printmaking as an applied art form are also contained in the vivid blue designs associated with Spode and Wedgwood that feature in Hague’s plate series. The iconic blue patterning of this pottery was achieved through transfer printing designs first engraved onto copper. 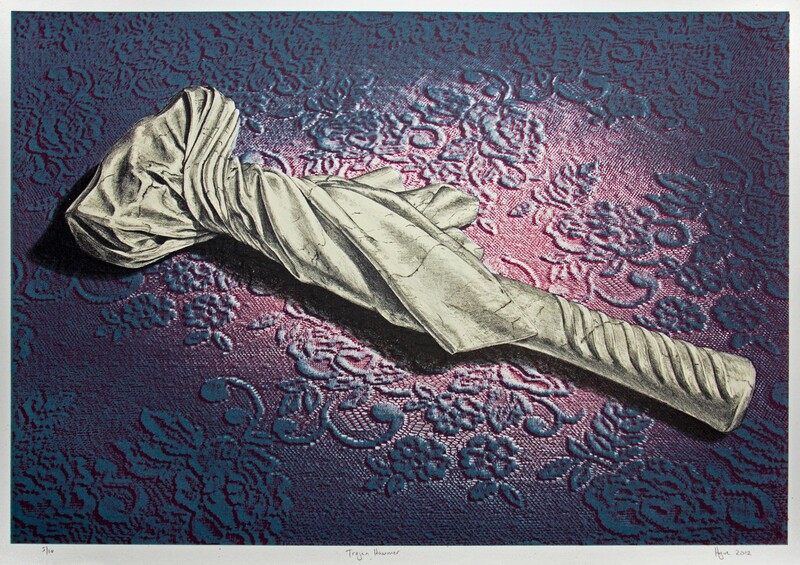 High art, low art, craft and history – all become reconfigured within Hague’s lithographs, as the artist frames a self-referential conversation of art made from art. As beautifully drawn illusionistic fantasies, such images readily engage the viewer on an aesthetic level. Yet deeper consideration reveals a more meaningful expression of dichotomies within art and politics that define our past, and inform our present. Tags: art, Australia, Colonialism, contemporary art, illustration, lithography, Marguerite Brown, printmaking, Robert Hague, Sculpture, The Art Vault. Bookmark the permalink.